alaTest has collected and analyzed 14 reviews of JVC GY HM100U. The average rating for this product is 4.0/5, compared to an average rating of 4.0/5 for other Camcorders for all reviews. Reviewers really like the durability and reliability. The design and image quality also get good opinions. There are some mixed opinions about the price, and there are some negative opinions about the size. We analyzed user and expert ratings, product age and more factors. Compared to other Camcorders the JVC GY HM100U is awarded an overall alaScore™ of 82/100 = Very good quality. alaTest has collected and analyzed 10 user reviews of JVC GY HM100U from Amazon.com. The average user rating for this product is 4.0/5, compared to an average user rating of 3.9/5 for other Camcorders on Amazon.com. Reviewers are impressed by the durability and portability. The reliability and design also get good comments, but some have doubts about the price. There are some mixed views about the image quality. The GY-HM100U is a one-of-a-kind small professional camcorder with the quality of a much larger model. And thanks to Dan Conklin for the great footage; visit his site at http://www.louddata.com/. 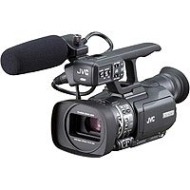 This JVC camcorder pushes the boundaries of what a professional shooter can expect from a small camcorder. It's ideal for tough shooting environments. The GY-HM100U is a compact handheld camcorder with performance and features found only in larger and more expensive models. It's designed to be easy to use, making it ideal for news reporters and producers. Seasoned shooters will find that its small size lets them work in environments where larger cameras would be impractical - all while producing recordings on par with broadcast cameras.